Banana leaves against a sky background. While eating the leaves of edible banana plants may not be harmful, the fiber in these leaves makes them difficult for humans to chew and digest. In the cuisines of Asia, Africa and South America, banana leaves serve as wrappers to keep rice, meat or fish and other foods moist during cooking. These broad, thick leaves also may function as serving dishes, providing a renewable alternative to paper plates, waxed paper, foil or parchment. The mature banana leaf consists largely of fibrous plant materials, including lignin and cellulose. Although your body can’t digest fiber, this rough material promotes healthy digestion by easing the movement of wastes through your digestive tract. As plants mature, the proportion of fiber to nutrients such as sugars, starches and proteins increases, making leaves and other plant-based foods more difficult for the human digestive system to process. Natives of subtropical areas of Bhutan, a state in South Asia, consume the young shoots and the fleshy root of the banana plant as food or for medicinal purposes. However, mature banana leaves are so fibrous that humans can’t consume them easily. 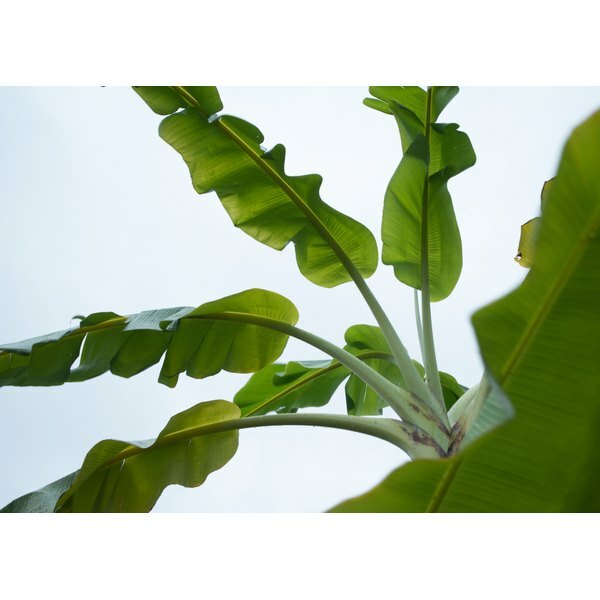 Reaching heights of up to 25 feet, the leafy banana plant is not a tree, but an herb. Cultivated in humid tropical regions, the banana plant encompasses a range of species in the Musa genus. While some species are grown strictly as ornamental plants or for the fiber content in their leaves, other species provide food in the form of their soft, starchy fruit and the stem of the young plant. The corm, or fleshy root, of the plant and the young stem are used as food sources in Ethiopian culinary traditions. Culinary use of the mature leaves include cooking, wrapping, storing and preserving other foods. Steaming rice, vegetables, fish or meat in banana leaves can preserve the food’s flavor and moisture without adding fat or calories. Fresh or frozen banana leaves are available in Asian markets in the produce or freezer sections. Cut the leaves to the desired size, removing veins or other toughened areas. Leaves will be softer and easier to roll if you quickly pour boiling water over them before wrapping the food, registered dietitian Nancy Berkoff advises. Frozen leaves may become soggy if you thaw them for longer than five minutes. To infuse food with the flavor of banana leaves, Berkoff recommends holding the leaves briefly over the burner of your stove for no more than a few seconds. In South American, African and Asian cultures, the fiber in banana leaves is used to produce fabric, thatching, floor coverings and other woven products. 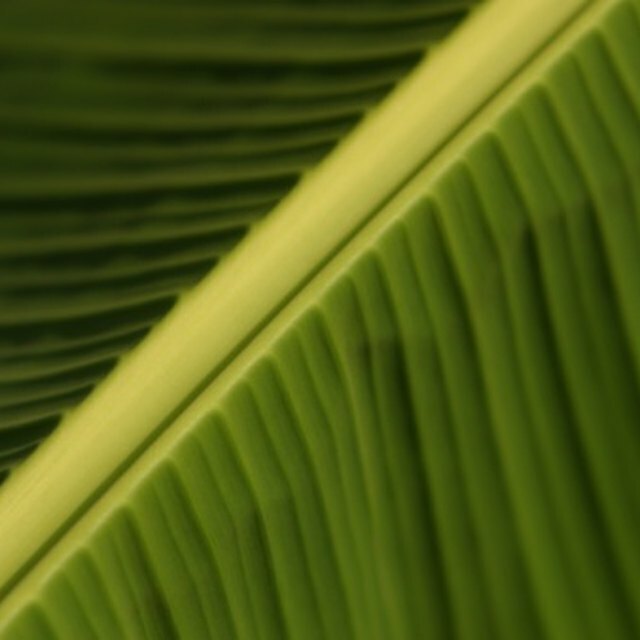 Clean, moist banana leaves have the potential to serve as dressings for burns or wounds when used with topical agents under medical supervision. In an article published in the August 2003 issue of “Burns,” M.A. Gore and D. Akolekar suggest that medical professionals in India consider banana leaves as an alternative dressing for partial thickness burns. Also known as second-degree burns, partial thickness burns involve damage to the top layer of your skin, or epidermis, and a portion of the underlying layer, or dermis. The waxy coating of banana leaves, their large surface area, the ease of application and the low cost compared with commercial medical dressings make them appropriate for use with some burn patients, the authors note.